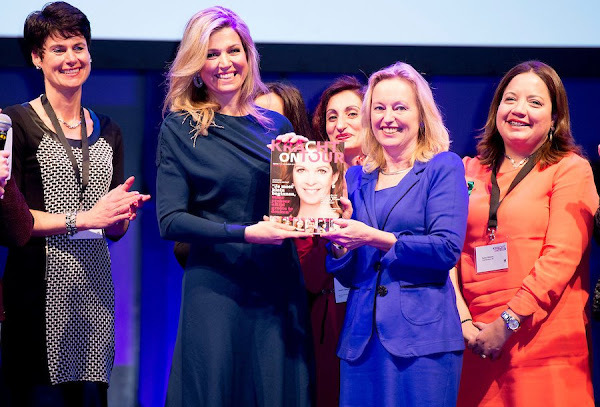 On November 27, 2015, Queen Maxima of The Netherlands attended the closing session of Power on Tour in the Fokker Terminal in The Hague, Netherlands. (Power on Tour is an incentive program that focuses on women who are financially vulnerable). Love her hair! Very beautiful! I am so glad to see her looking well again - for a few days she was not her usual cheerful self, but I think she has regained her energy. Lovely to see her! Every time I look at these photos I can't stop chuckling.... Maxima clearly adores her spiders! That is the hairdo she should have always. Very feminine and elegant look. Stunning! Lovely hair, makeup, outfit, and her beautiful eyes are sparkling, but I hate those brooches. I couldn't even handle them, let alone wear them. They give me the creeps. Finally, her hair looks normal and fits her. Anon 9:57. I agree completely. Those spiders give me the shivers!